Since June 2014 the ECB has adopted a series of new monetary policy measures, with the aim to both enhance the transmission of policy and to reinforce the accommodative policy stance to counter growing risks of a too prolonged period of low inflation. Those measures have included reducing key policy rates to levels below zero, introducing a credit easing package – specifically our Targeted Long-Term Refinancing Operations (TLTROs) – and expanding our Asset Purchase Programme (APP). They were decided against the backdrop of credit dynamics that were at the weaker end of what can typically be observed in the aftermath of banking crises, and, from summer of 2014 onwards, heightened downside risks to the inflation outlook and a concrete threat to the stability of inflation expectations. This complex package of policy measures has led to a significant easing in borrowing rates for the broad economy and should thereby continue to contribute to the recovery of the euro area economy and the return of inflation rates in the medium term to levels closer to 2%. Early evidence confirms that the current policy measures are delivering tangible results, in particular by improving financing conditions faced by firms – including small and medium-sized ones – and households, thereby stimulating credit demand and spending. Starting with the cost of bank credit, this has fallen sharply across euro area Member States as banks’ funding conditions have eased and competition among lenders has accelerated in the wake of our policy measures. Before the launch of the June 2014 credit easing package the bulk of the reduction in ECB key policy rates – a cumulative 125bps between September 2011 and June 2014 – had not been transmitted to the borrowing costs faced by households and firms in many vulnerable Member States. From May last year (when markets started to anticipate the credit easing package) until October this year, however, bank lending rates for non-financial corporations (NFCs) fell strongly, by approximately 80bps for the euro area in aggregate. To put that in perspective, ECB staff estimates suggest that a reduction of the standard policy rates by around 100bps in June 2014 would have been required to achieve a similar effect on the rates banks apply to corporate loans. Moreover, lending rates to NFCs fell by some 110-140bps in major vulnerable Member States, suggesting that the pass-through of the ECB’s policy stance has become stronger in those countries that were hit hardest by the crisis and where economic slack was concentrated. This decline in fragmentation can be in part explained by the effects of the TLTROs. Evidence from the bidding behaviour of banks confirms that TLTROs participation is frequently followed by a compression in lending rates. That is linked to TLTRO borrowers scaling back their recourse to more expensive wholesale funding, in particular unsecured, which has created scope for banks to reduce lending rates. The transmission of the improvement in banks’ funding conditions to lower bank lending rates has been further empowered by an increase in lender competition for good credit spurred by our measures. The APP has reinforced this fall in bank lending rates, too, by putting strong downward pressure on sovereign yields and thereby reducing the attractiveness of sovereign securities holdings relative to loans. Indeed, alongside the direct impact of TLTROs on bank lending conditions, staff analysis finds that the APP has had an indirect effect on bank lending conditions through its marked effect on long-term government bond yields. This indirect effect has been further reinforced by the beneficial impact of lower long-term yields on the macroeconomic outlook and hence on the credit component embedded in lending rates. With bank lending rates lower, the volume of loans to NFCs is now recovering in the euro area as a whole as well. In May last year, before the announcement of the credit easing measures, loans to NFCs contracted at an annual rate of 2.9% in the euro area as a whole. Since July 2015, however, the year-on-year contraction has stopped and loans have started to grow at a very modest rate just above zero. As a result, fewer small and medium-sized companies (SMEs) report that credit has been a limiting factor for their businesses. In fact, the last results of the Survey on the Access to Finance of Enterprises (SAFE), conducted in April this year, show that “access to finance“, which was considered the dominant concern of SMEs in 2012, is now considered the least important problem. “Finding customers” is instead still a primary source of concern for SMEs. These results mask some heterogeneity: in the major vulnerable Member States loans are still contracting compared to a year ago. But the pace of contraction has slowed considerably in these economies. This reflects both improved funding conditions for banks thanks to the TLTROs and APP, and strengthening demand for loans amid an improving economic outlook and lower lending rates. Loan supply can be expected to benefit further from the staggered impact of TLTROs. The APP should also continue to support credit growth going forward. Banks gain additional liquidity from the APP either through selling marketable assets or through rising customer deposits, which they can in turn use for refinancing, purchasing assets or granting loans. 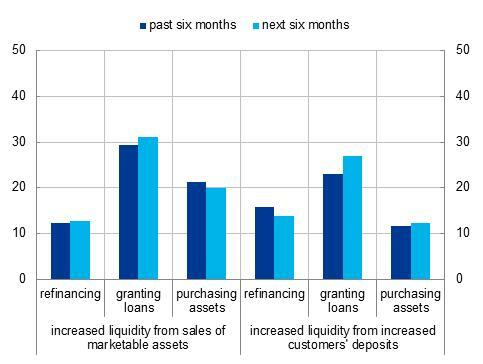 In their responses to the October 2015 Bank Lending Survey, most euro area banks indicated that they had used the additional liquidity from the APP for the latter – granting loans (about 30%) – and over the coming six months, this pattern can be expected to continue. Banks also indicated a net easing impact from the APP on their credit standards over the past six months (loans to enterprises: -4%, housing loans: -2%, consumer credit and other lending to households: -1%). And over the next six months, banks expect a continued easing impact on credit standards for loans to enterprises (-2%), while the effect on credit standards on housing loans and consumer credit is expected to remain broadly unchanged. Notes: The net percentages are defined as the difference between the sum of the percentages for “tightened considerably” and “tightened somewhat” and the sum of the percentages for “eased somewhat” and “eased considerably". The results shown are calculated as a percentage of the number of banks which did not reply “not applicable”. 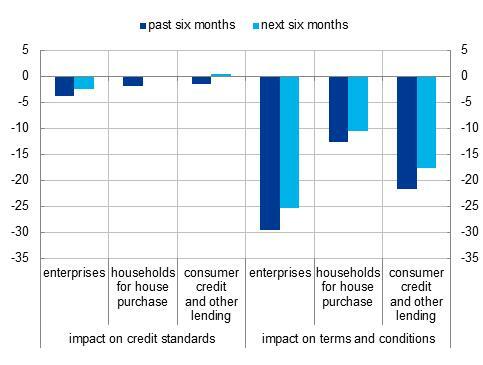 The effects of APP appear to be stronger still when looking at the impact on credit terms and conditions (loans to enterprises: -29%, housing loans: -13%, consumer credit and other lending to households: -22%; see Chart 24b), and the reported easing in terms and conditions for enterprises is generally larger than reported in the previous survey round. This favourable impact is also expected to continue over the next six months. One should keep in mind, however, that these positive expectations may not immediately translate into higher loan growth. That is a process that takes time to materialise, not only owing to operational considerations but also because the reaction of loan demand to improved supply conditions involves lags. It is therefore probable that the first stage of rebalancing will affect mainly the liability side of banks’ balance sheets – i.e. funding substitution – before banks move on to the deployment of asset expansion strategies to off-load the reserves received. Summing up, there is substantial evidence that our monetary policy measures are having the effects intended. But in a context of increasing downside risks to the inflation outlook, especially driven by continued declines in oil prices and a large output gap, and downside risks to the global economy and a still fragile domestic recovery, the Governing Council decided that the calibration of those measures needed to be adjusted. At its December 2015 meeting, the Governing Council therefore decided to lower the interest rate on the deposit facility by 10 basis points to -0.30% and to extend the intentional end-date for APP by 6 months to March 2017, although subject to an on-going verification of the prospects for inflation to normalise within a meaningful horizon. The monthly purchases of €60 billion under the APP are now intended to run until the end of March 2017, or beyond, if necessary, and in any case until the Governing Council sees a sustained adjustment in the path of inflation consistent with its aim of achieving inflation rates below, but close to, 2% over the medium term. Importantly, the Governing Council also decided to reinvest the principal payments on the securities purchased under the APP as they mature, for as long as necessary. This recalibration will have a sizeable impact on the ECB balance sheet and on excess liquidity. Overall, the extension of the asset purchases to at least March 2017 and the decision to re-invest the principal payments on maturing securities for as long as necessary will inject an additional EUR 680 billion – about 6.5% of the euro area GDP – in liquidity to the system by 2019. This will strengthen our forward guidance on interest rates, ensure accommodative financial conditions and further strengthen the substantial easing impact of the measures we have taken since June 2014. Altavilla C., G. Carboni, R. Motto (2015) Asset purchase programmes and financial markets: lessons from the euro area, ECB Working Paper No. 1864.